Planet: Andoria. 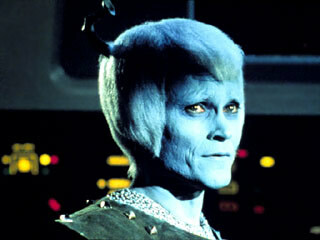 Humanoid Federation members are blue-skinned in appearance and have bilateral antennae and characteristically white hair. Andorians are self-described as a violent and warlike species. No members of this Federation race were aboard the U.S.S. Enterprise NCC-1701-D when Data's offspring, Lal, was "born." Lal rejected an Andorian female as one of four final choices for a racial type, instead opting to become a human female. Apparently, according to Data on stardate 43657.0, Andorians engage in group marriages of four as a rule. However, most of what is known about this race is scattered. Andorian renegades, in the Triangular system , it is said once embarrassed a Starfleet admiral's supposed search when they hid their ship by dismantling it. An Andorian was present at Risa when Captain Picard vacationed there on stardate 43745.2, and also an Andorian group bid for Tellurian spices offered by Kivas Fajo on stardate 43872.2. This Federation member-race was the subject of some kind of gender-swapping joke by Quark that Morn was slow to catch; the punchline was "and the Andorian says, 'Your brother? I thought it was your wife!'" Andor is among the many planets providing a registry home to numerous ships that use Deep Space Nine. Their variety of silk is prized for its softness. Andorian jewelry is highly collectible and is not usually available on Deep Space Nine — one of Quark's would-be expanded sales items by inter-station monitor. Chirurgeon Ghee P'trell, an Andorian, was nominated for the Carrington Award in 2371. -Ambidextrous: Andorians can use either hand for manual tasks without incurring penalties. -Antenna: The antenna house both auditory and visual receptors. This gives the Andorians quadriscopic vision, for enhanced depth perception, that extends into the infrared -as well as an extended range of auditory frequencies. This gives them a +2D to most visual perception rolls, and +2 to most rolls based on hearing. -Limited Exoskeleton: Andorians are unusual for having both mammalian and insectoid features. The Andorians posses a limited exoskeleton that gives a + 1 bonus against physical and energy attacks. The Andorians have a history of violent conquest. However, they will not become difficult without reason. Once their anger is released, their savagery and fighting abilities are impressive. The Andorians are a race from the outer rim territories and really don't have much to do with Galactic politics. They are a race known far and wide for the salesmanship skills and are frequently seen at the 'Bazarre' a flea market like planet on the outer rims.